Premium organic ice cream and fruit sorbet Rachelli, the long established family firm of Milan, delights us during the summers with a variety of biodynamic ice cream flavors, including Stracciatella, Hazelnut, Chocolate, Vanilla, Yoghurt, Coconut, Strawberry-yoghurt, Strawberry, Mango, Raspberry, Lemon and the new flavor cafe. For over 70 years the Rachelli name has stood for premium ice cream of the highest quality inside and outside of Italy. 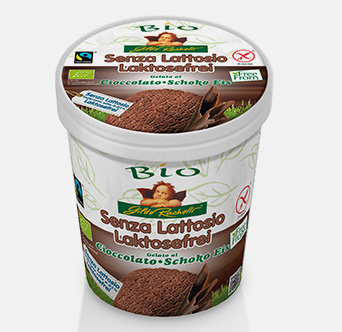 This organic ice cream is made exclusively from bio-dynamic milk and cream, bio-dynamic fruit or ingredients from controlled organic production. It does not contain any flavour or additive such as emulsifiers or stabilizers. For Rachelli this is the logical development of their own high quality standards. Producing homemade style ice cream is an art. Ermenegildo Rachelli, the founder of the firm, learned the techniques in the 1930s from an experienced Sicilian ice cream confectioner. It is no surprise that the majority of the his recipes remain a strictly guarded family secret to this day. However, his grandson and current marketing director, Dr. Vinicio Rachelli is willing to divulge some of the reasons for their continued success: “Our ingredients are chosen very carefully, we process only fresh bio-dynamic milk and cream or freshly harvested bio-dynamic fruit. 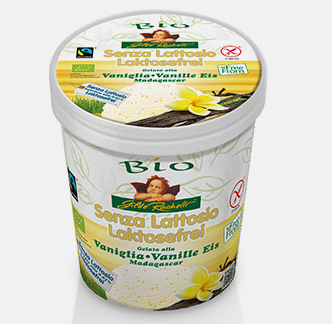 As a result, we can easily forgot any use of flavors.” Constant supervision of the ice cream production process by Rachelli itself and by the Demeter Association in Italy guarantee high quality and use of 100% organic ingredients as prescribed by Demeter International and EU organic guidelines. Tume sokolaadi glasuuriga 30%. vaarika puree 23%..